Fun Dip A pouch of fruit flavored sugar with an editable dipping stick. Each pack comes with 1 flavor of fun dip either: Razz apple-Magic and Cherry-Yum-Diddly. At one time this Willy Wonk Candy was called Lik M Aid. 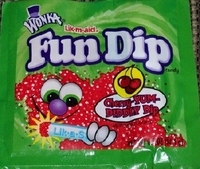 You get 10 fun dip candy packs per goody bag 5 of each of the fun dip flavors, Razz apple-Magic and Cherry-Yum-Diddly. You can also get a whole box of 48 count of fun dip in our Willy Wonka candy section.